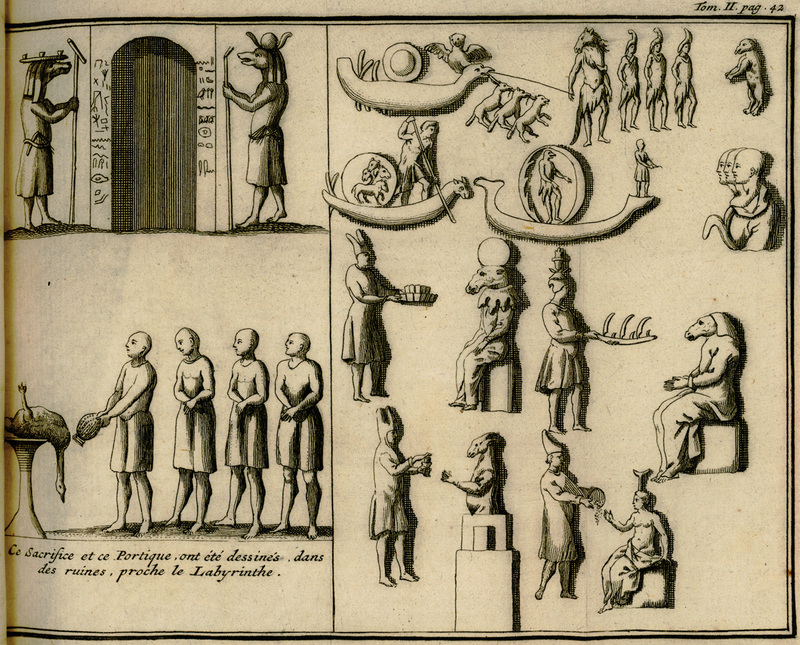 Paul Lucas, antiquary to King Louis XIV voyages to Egypt. He penetrates the underground passages of the Labyrinth. Paul Lucas (1664 – 1737) was a French merchant, naturalist, physician and antiquarian to King Louis XIV. He travelled extensively in Greece, Turkey, the Levant and Egypt, in three major voyages (1699–1703), (1704–1708) and (1714–1717). He was the son of Centurion Lucas, well known book printer and publisher in Rouen and Judith Mauclerc. In 1688, he served with the Venetians at the Siege of Negroponte. In 1696 he returned to France with a large collection of medals and other antiquities which were purchased for the French Royal Cabinet. This brought him to the attention of the court and he then began the series of three voyages. Lucas is one of the earliest sources of information from Upper Egypt, visiting among other places Thebes (though he does not identify it) and the Nile up to the cataracts. A story is told of an old Arab who had explored the ruins many years earlier, penetrating into underground passages surrounded by niches ‘like little shops’. He tells of endless underground alleys and rooms branching off in such number as to seem infinite. When Lucas investigated the passages could not be found. View and floor plan of the ancient Egyptian labyrinth mentioned by Herodotus, near ancient Crocodilopolis (today Fayum). 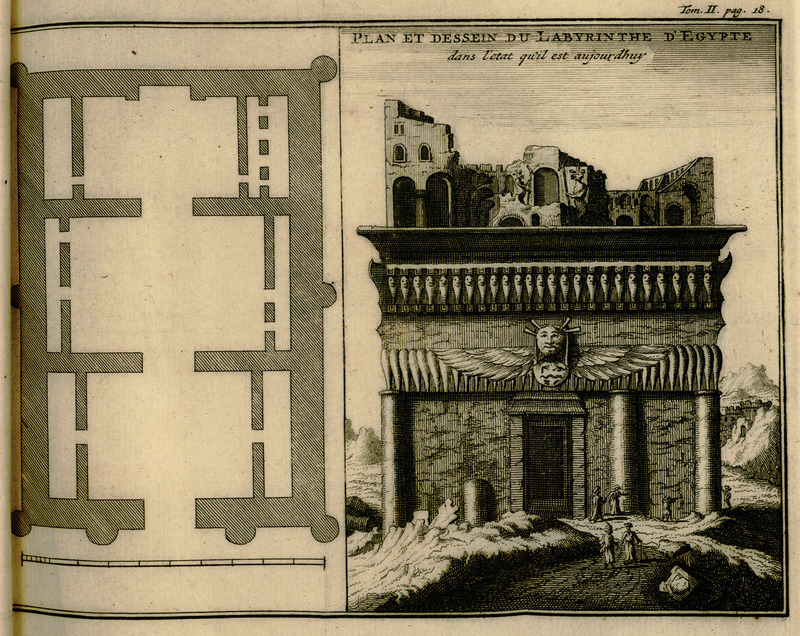 Plan et dessein du labyrinthe d’Egypte dans l’etat qu’il est aujourhuy. LUCAS, Paul. Voyage du sieur Paul Lucas fait en MDCCXIV, &c. par ordre de Louis XIV, dans la Turquie, l’Asie, Sourie, Palestine, Haute et Basse Egypte, &c…, vol. ΙΙ, Amsterdam, Steenhouwer & Uytwerp, 1720. Reliefs from the sacrificial altar and portico of the ancient Egyptian labyrinth mentioned by Herodotus, near ancient Crocodilopolis (today Fayum). Ce Sacrifice et ce Portique, ont été dessinés dans des ruines, proche le Labyrinthe.